Nugget hops were originally used just for bittering, but has now been widely accepted as a dual-purpose ingredient. High oil levels let Nugget hops' aromatic properties of mild spice and herbs with peach and pear shine through. Low Cohumulone levels may contribute to its smooth bitterness. A versatile hop you could use in an IPA, Barley Wine, ESB, and more..
Use this with Crystal hops for my Blonde ale. Taste great in any ale. Nugget remain my favorite bottering hop for American pale ales and IPAs. Clean as can be. 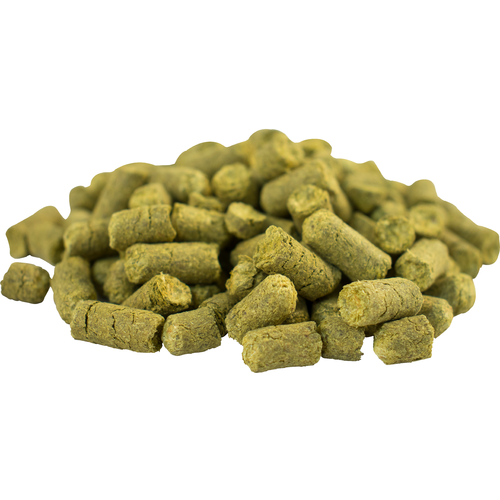 Have used for late additions with success as well blending with other varieties to take the edge off the in your face aroma of some of the newer citrus hops. Product performed to expectation. Delivery was prompt. Packaging was very functional (re-sealable foil/plastic pouch) and attractive. In a effort to maximize my brew budget I tried these as an economical alternative to the more expensive bittering hops and they work great for my IPA's. I honestly can't tell any difference and they are now my staple for bittering.